Author(s) Brown, William; Clay, Charles Travis; Price, M. J. Stanley; Hebditch, M. J. 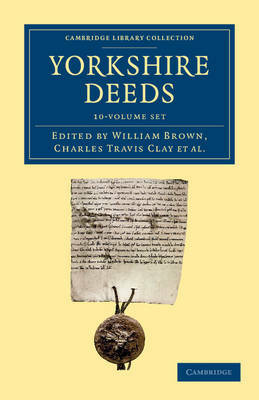 Published between 1909 and 1955, this ten-volume collection contains deeds relating to all of Yorkshire, from the twelfth to the seventeenth century. The deeds are of local historical interest, and provide topographical, philological and genealogical information, as well as insights into daily life. The majority of the records here are presented as abstracts, while documents in the vernacular that are of greater interest or importance are printed in full. Where possible, the documents are dated. Thorough background information and discussion of the deeds is included, as are notable physical descriptions, in particular of the seals. Each volume concludes with an index of people and places. At first edited by William Brown, (1854-1924), this well-respected series was largely edited by Charles Travis Clay (1885-1978), who was renowned for the outstanding quality of his work, particularly in dating documents.